The team at Gasthof Post will spoil you with culinary delights at the regional Hut Essen. You can book from 2 to 60 persons the Hut Essen – a special treat. At the beginning, we serve a bowl of crispy salads and fresh bread. Of course, various sauces and Ofenkartoffeln must not be missing! Then a “hat” is placed in the middle of the laid table. 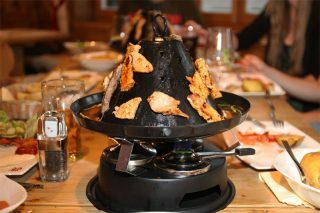 A “hat” is a special fondue in the traditional form of a Tatar hat. A paste burner heats the surface on which you sear your beef, turkey and pork. The advantage of the Tatar hat lies in the even heat distribution over the entire surface of the hat. You can decide for yourself if you want to have your meat raw, medium rare or well done. A bouillon is poured into the juice channel, which has already been filled with vegetable strips in advance. The running down meat juice makes the soup even more tasty. The connoisseurs pour over the frying meat with the soup to intensify the taste even more. Price pro Person : € 22,50-. Child until 12 years : € 12,50-.